1 Copyright ÂŠ 2011 Pearson Education, Inc.
5) Isotopes are atoms of the same element that differ in their: A) number of electrons. B) number of neutrons. C) number of protons. D) ionic charge. 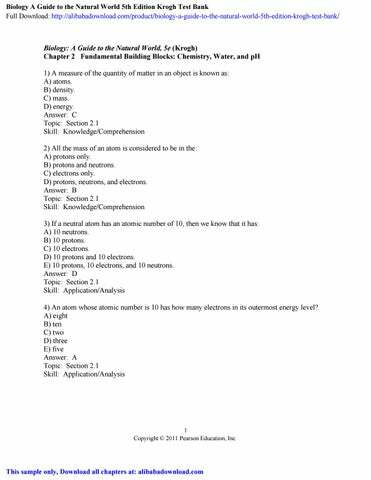 Answer: B Topic: Section 2.1 Skill: Knowledge/Comprehension 6) All the atoms of the same element will have the same: A) number of protons. B) number of neutrons. C) number of protons and neutrons. D) mass. Answer: A Topic: Section 2.1 Skill: Application/Analysis 7) From its atomic number of 10, you can predict that a neon atom: A) is not chemically reactive. B) has an unfilled outer shell. C) has 10 neutrons. D) can easily gain or lose electrons. Answer: A Topic: Section 2.1 Skill: Application/Analysis 8) Which of the following are found in the nucleus of an atom? A) protons B) neutrons C) electrons D) protons and neutrons E) protons, neutrons, and electrons Answer: D Topic: Section 2.1 Skill: Knowledge/Comprehension 9) An element with 22 protons, 22 neutrons, and 22 electrons would have an atomic number of: A) 44. B) 22. C) 66. D) 11. Answer: B Topic: Section 2.1 Skill: Application/Analysis 2 Copyright ÂŠ 2011 Pearson Education, Inc.
3 Copyright ÂŠ 2011 Pearson Education, Inc.
14) Which of the following results from the making of a bond? A) Atoms become more reactive. B) Molecules are broken down. C) Electrons are destroyed. D) Atoms become more stable. Answer: D Topic: Section 2.2 Skill: Knowledge/Comprehension 15) For an atom to be considered an ion: A) protons can outnumber neutrons. B) protons can outnumber electrons. C) neutrons can outnumber protons. D) protons equal electrons. Answer: B Topic: Section 2.2 Skill: Knowledge/Comprehension 16) As the difference in the electronegativity between atoms forming a chemical bond increases, the: A) less polar the molecule. B) more polar the molecule. C) more stable the molecule. D) more symmetrical the molecule. Answer: B Topic: Section 2.2 Skill: Application/Analysis 17) A polar covalent bond results when: A) two atoms share electrons equally. B) two atoms of the same element are sharing electrons. C) one of the atoms sharing electrons is more electronegative than the other atom. D) two atoms sharing electrons are equally electronegative. Answer: D Topic: Section 2.2 Skill: Knowledge/Comprehension 18) An atom will react with other atoms only until: A) it has completely filled its outermost energy level. B) it has less stability. C) all of its inner orbitals have been filled. D) it forms four covalent bonds Answer: A Topic: Section 2.2 Skill: Knowledge/Comprehension 4 Copyright ÂŠ 2011 Pearson Education, Inc.
5 Copyright ÂŠ 2011 Pearson Education, Inc.
6 Copyright ÂŠ 2011 Pearson Education, Inc.
7 Copyright ÂŠ 2011 Pearson Education, Inc.
8 Copyright ÂŠ 2011 Pearson Education, Inc.
9 Copyright ÂŠ 2011 Pearson Education, Inc.
10 Copyright ÂŠ 2011 Pearson Education, Inc.
43) As an acid mixes in water: A) the number of hydroxide ions will increase. B) the number of hydrogen ions will increase. C) the pH remains at 7. D) it becomes buffered. Answer: B Topic: Section 2.7 Skill: Knowledge/Comprehension 44) Buffering systems work to maintain pH within normal limits by: A) adding hydrogen ions when conditions becomes too acidic. B) adding hydroxide ions when conditions become too basic. C) removing hydrogen ions when conditions become too acidic and adding hydrogen ions when conditions become too basic. D) adding hydrogen ions when conditions become too acidic and removing hydrogen ions when conditions become too basic. Answer: C Topic: Section 2.7 Skill: Application/Analysis 45) An atom always contains the same number of protons as neutrons. Answer: FALSE Topic: Section 2.1 Skill: Knowledge/Comprehension 46) Neutrons are negatively charged. Answer: FALSE Topic: Section 2.1 Skill: Knowledge/Comprehension 47) Anything that occupies space and has mass is energy. Answer: FALSE Topic: Section 2.1 Skill: Knowledge/Comprehension 48) An element can't be broken down into another form of pure matter. Answer: TRUE Topic: Section 2.1 Skill: Knowledge/Comprehension 49) The number of neutrons in the nucleus of an atom gives it a unique chemical nature. Answer: FALSE Topic: Section 2.1 Skill: Knowledge/Comprehension 11 Copyright ÂŠ 2011 Pearson Education, Inc.
12 Copyright ÂŠ 2011 Pearson Education, Inc. Match the following. A) positive charge B) outer electrons C) ionic bond D) no electric charge E) hydrogen bond F) nonpolar covalent bond G) negative charge H) polar covalent bond 56) Protons Topic: Section 2.1 Skill: Knowledge/Comprehension 57) Neutrons Topic: Section 2.1 Skill: Knowledge/Comprehension 58) Electrons Topic: Section 2.1 Skill: Knowledge/Comprehension 59) Results from an unequal sharing of shared electrons Topic: Section 2.2 Skill: Knowledge/Comprehension 60) Results from an equal sharing of electrons Topic: Section 2.2 Skill: Knowledge/Comprehension 61) Are involved in chemical reactions Topic: Section 2.2 Skill: Knowledge/Comprehension 62) Results from electrons being transferred from one atom to another Topic: Section 2.3 Skill: Knowledge/Comprehension 63) Explains the attraction of water molecules for each other Topic: Section 2.4 Skill: Knowledge/Comprehension Answers: 56) A 57) D 58) G 59) H 60) F 61) B 62) C 63) E 13 Copyright ÂŠ 2011 Pearson Education, Inc.
14 Copyright ÂŠ 2011 Pearson Education, Inc.
15 Copyright ÂŠ 2011 Pearson Education, Inc.
77) Oil spills in the ocean are often treated with chemical dispersants. These materials are similar to detergents in that the molecules have both hydrophilic and hydrophobic portions. Based on this, predict what will happen when chemical dispersants are used to treat oil spills. Answer: The dispersant molecules have a hydrophobic portion that will dissolve in the oil and a hydrophilic portion that will dissolve in the water. This will cause the oil to be broken up into small droplets suspended in the water. Topic: Section 2.6 Skill: Synthesis/Evaluation 78) You have been having trouble with acid indigestion recently. You buy some milk of magnesia, an antacid, from the drug store to relieve your indigestion. Milk of magnesia is a mixture of magnesium hydroxide in water. What makes milk of magnesia a good antacid? If you could chemically analyze your stomach fluids, what would you find before and after taking the antacid? Answer: Magnesium hydroxide provides hydroxide ions, which will neutralize the acidity by removing hydrogen ions. Stomach fluids will have a low pH before taking the antacid and a higher pH afterward. Topic: Section 2.7 Skill: Application/Analysis Refer to the figure below, and then answer the question that follows. 16 Copyright ÂŠ 2011 Pearson Education, Inc. Refer to the figure below, and then answer the question that follows. 17 Copyright ÂŠ 2011 Pearson Education, Inc.
81) You are working in a chemistry lab, and your lab partner knocks over a beaker of hydrochloric acid. You alert your laboratory instructor, and he immediately pours another solution over the spill to neutralize the acid. Using the figure as a guide, what did your instructor pour onto the acid to neutralize it? A) water B) baking soda C) lemon juice D) coffee Answer: B Topic: Section 2.7 Skill: Knowledge/Comprehension 18 Copyright ÂŠ 2011 Pearson Education, Inc.